Oh I wish I had pictures to share today! I don’t because I didn’t plan ahead and I don’t have my camera cord with me. I am using the Levi Fader Fort blogger lounge to send this message out. Tomorrow I will remember to bring it. Today has been a great day in Austin, TX. The sun is shining, the sky is blue, Mark is getting sunburnt (ok,maybe that’s not good, but it is a good indication we are in Austin! )… This morning I woke up with a mission to get from where I slept last night to where I was to sleep tonight, and after about 20 minutes of waiting at a bus stop I got on a Metro bus and got to my destination with much less trouble than I had anticipated. We are staying a a cute little place called the “Wee cottage” on the south side of Austin. I arrived and waited for my husband to get in. It was wonderful to see him after being apart for 6 days! He and the other half of Standard Recording headed out to 6th street to get their party on, and I waited for my lunch date to arrive. I had a great lunch with the awesome Jennifer Perkins at an awesome Mexican place. I filled up on salsa and quesadilla pretty fast, and we spent lunch chatting about all sorts of crafty goodness. It was such a fun lunch! (Thanks again Jennifer!) 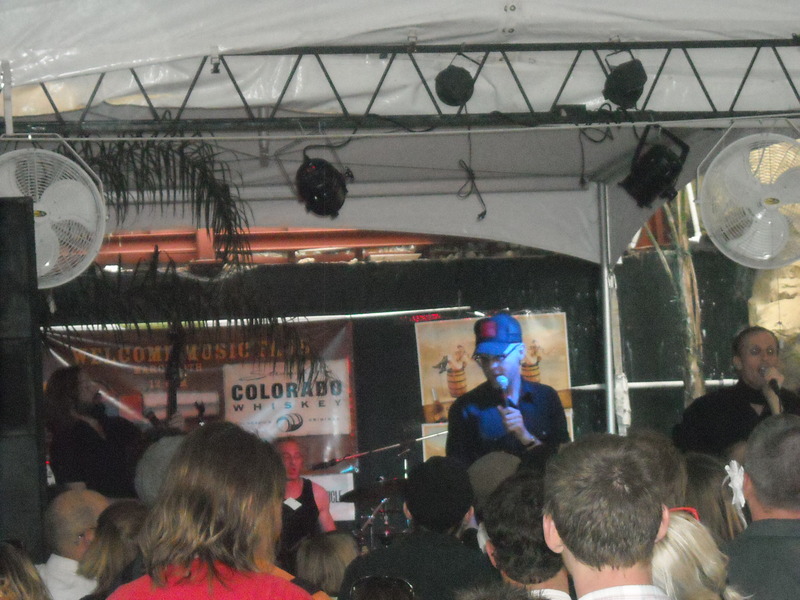 After that, I met up with my hubby and friends down on 6th street. 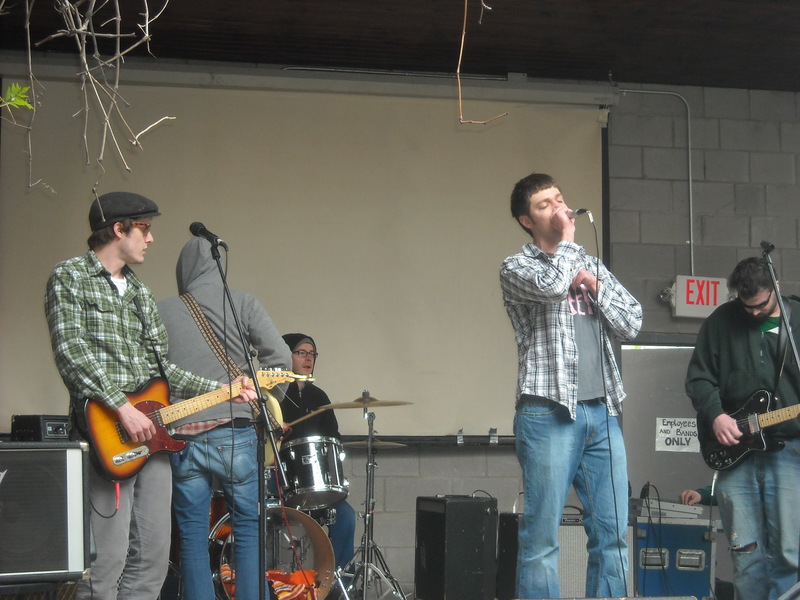 Since then we have been scouring for free booze and free, good music. Right now we are planted at the Levi Fader Fort enjoying free Budwieser and Southern Comfort drinks. Our plans for the rest of this St. Patty’s day don’t amount to much. 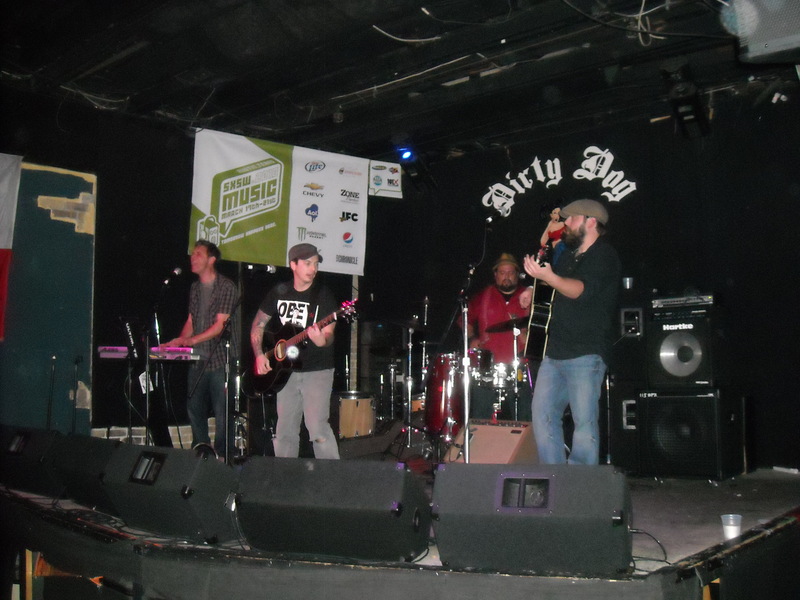 We have a day party tomorrow at the Dirty Dog. We have to get up early to get ready for our party. 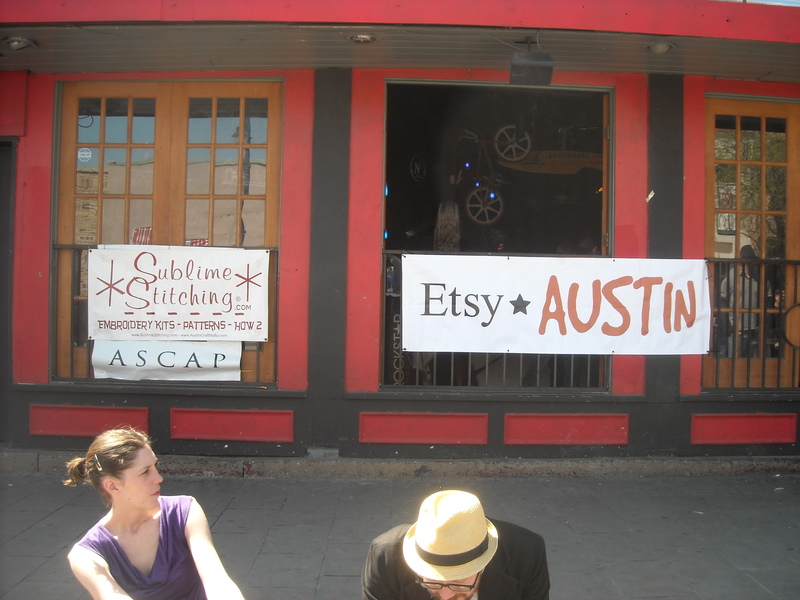 If you haven’t heard the news yet, we are having a day party tomorrow with free music, free make-and-take crafts hosted by Etsy Austin, free on-demand silk screen shirts from Yudu/Provocraft, and Jenny Hart from Sublime Stitching will be there with goodies and patterns, and I’ll be there with my jewelry as well. The party kicks off at noon and goes til 6 at the Dirty Dog, so please stop by and say hi! If you need more details, you can visit the Standard Recording site for RSVP info. It is free for you to get in, but we do ask for you to RSVP if you’re coming. I look forward to seeing ya’ll tomorrow. Stop by my table and say hello. Mention the secret code word “CRAFTY” and get a free prize with a purchase of a pendant! Well, first of all, if you don’t know what SXSW is, it is South By South West, and it is a gigantic music festival in Austin, Texas held every year in March. 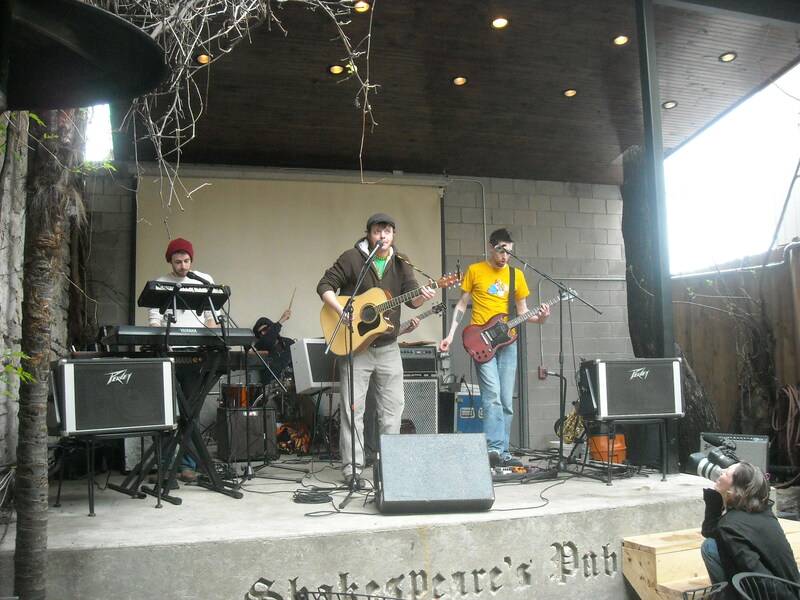 If you’ve never been, the main premise (or at least what I have done for the past 2 years now) is go to as many free shows as you can, while also finding as much free food as you can, while also drinking more free booze than you every thought you could, and all starting at a refreshing 11am. Me (on the right) with the most awesome Jenny Hart of Sublime Stitching at last year's party. 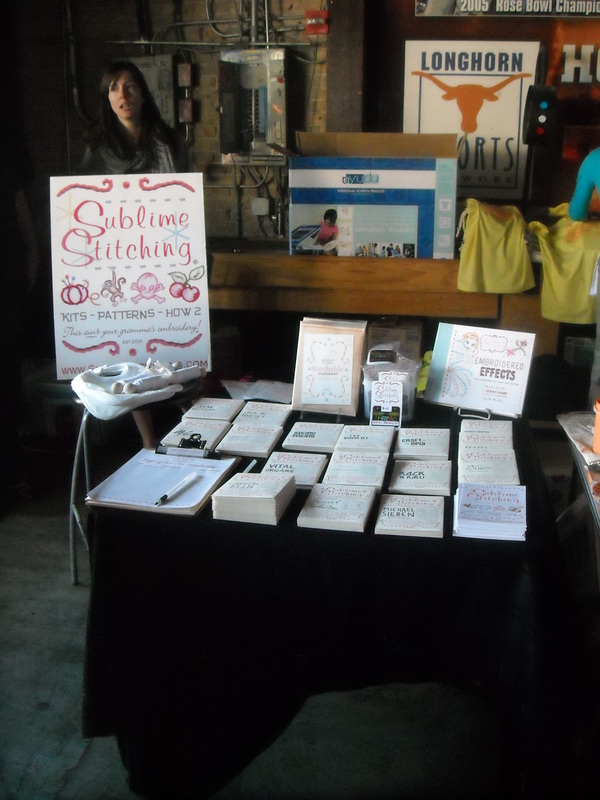 Last year Standard Recording Company had an awesome day party with co-sponsors Craftster, Yudu, VenusZine, and Sublime Stitching. There was rock and roll all day long and craft tents outside. 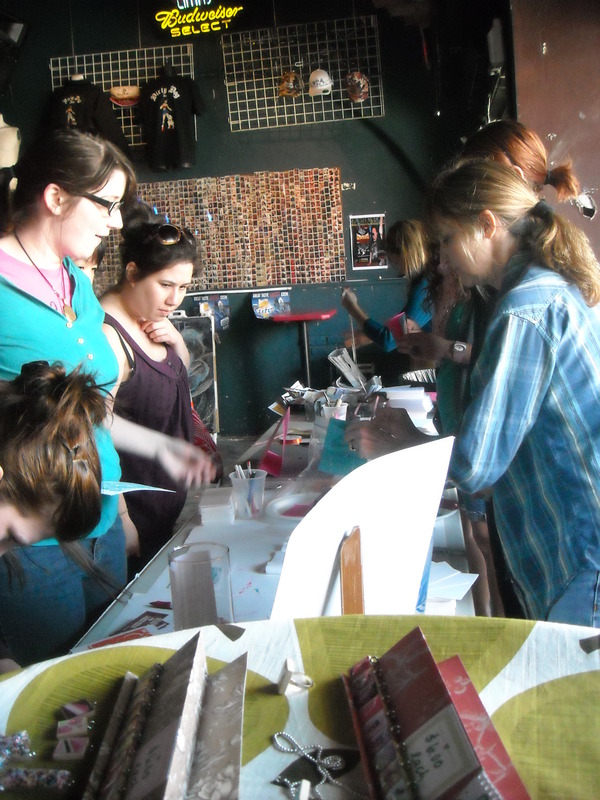 You can read more about it on the Craftster blog about last year’s party. 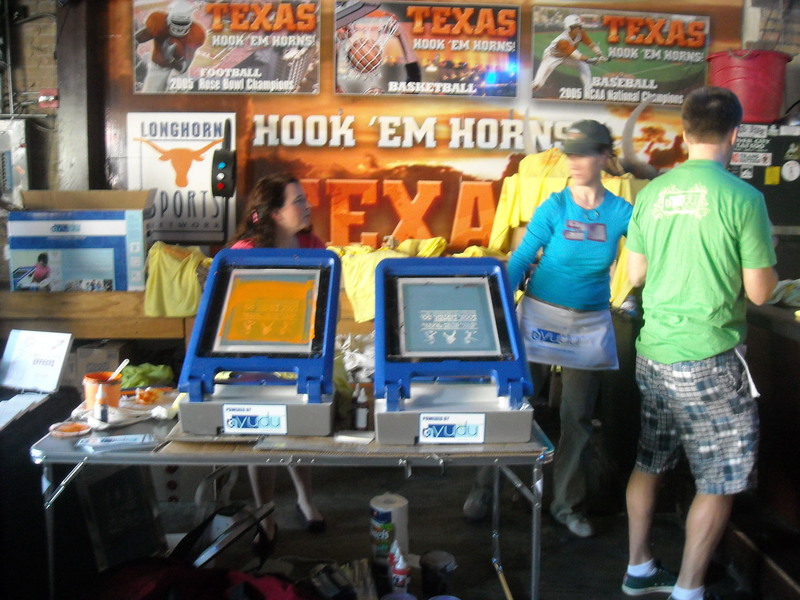 The YuDu booth at last years SXSW party! 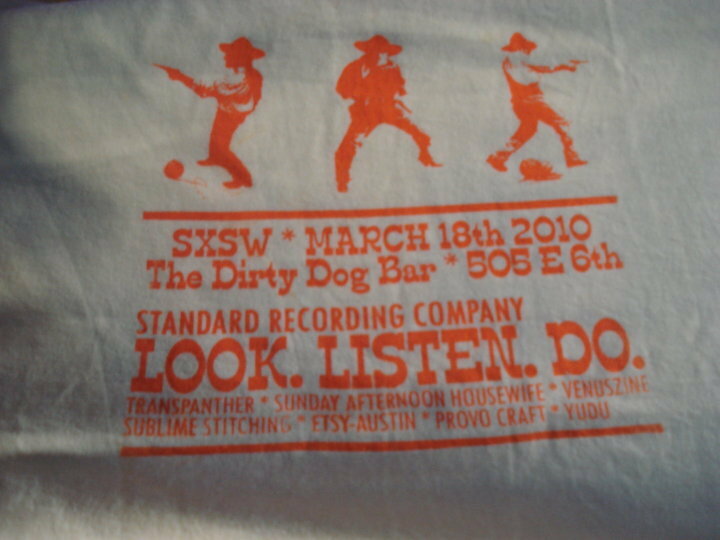 This year I’m proud to say that I am an official sponsor of the Standard Recording Company SXSW day party on March 18th at the Dirty Dog Bar along with returning sponsors Yudu/ProvoCraft, VenusZine, Sublime Stitching, and new sponsors TransPanther and Etsy Austin! If you want to attend this awesomness, you’re going to have to RSVP here. 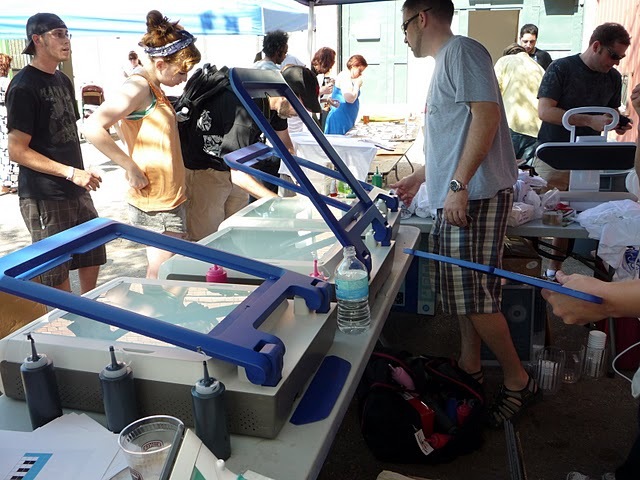 This year promises to be even more fun with make-and-take crafts, free silk screen shirts and totes from YuDu, and lots of other prizes, and, of course, free beer! The party is only three weeks from today and I can’t wait to see you all there! Make sure you stop by my table to say hello and we’ll take a picture to remember the day by. I’ll be posting on the blog all the fun we are having that week…well, you’ll have to just keep checking back to see! Great news! 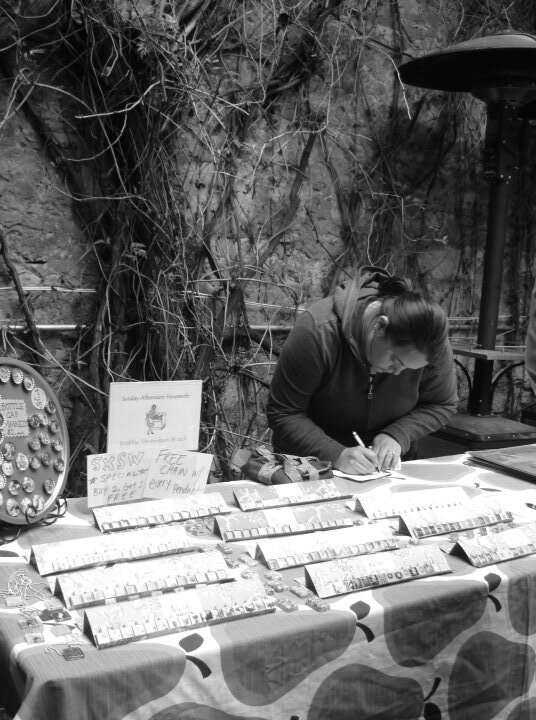 Yesterday I was accepted into the Funky Finds Spring Fling 2010 craft fair in Fort Worth, Texas. It’s March 13th. The following weekend Mark and I will be in Austin, TX for SXSW, so I’m really excited I get the chance to fly down to Texas a whole week early and sell my crafts and then roam around the state for a few days before hitting SXSW. My favorite trip of the year just got a whole lot better! More news to follow on the Texas date as well as an update later today on how my weekend went in Covington, KY.
As we have for the past 2 years, Mark and I will be heading down to Austin, TX for SXSW music festival in March. 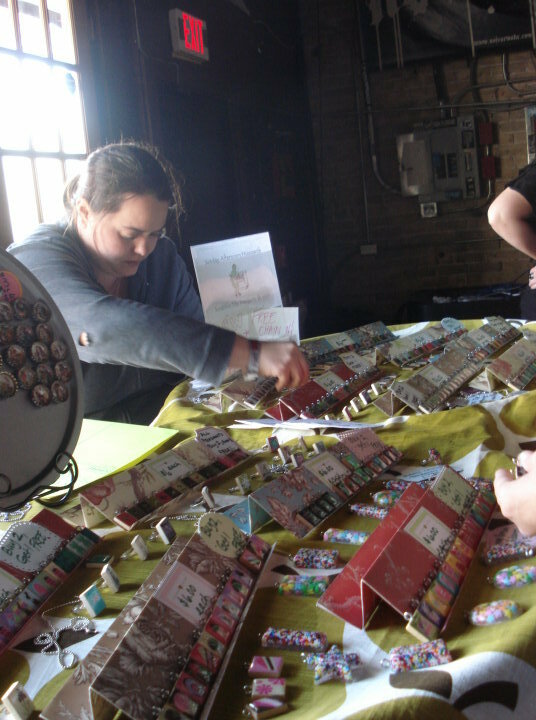 Mark (well, Standard Recording) will be having a showcase again this year, and hopefully we will be paired up again this year with Craftster and possibly even some of the Austin Craft Mafia (last year Jenny Hart of Sumlime Stitching fame had a booth at our showcase). And it gets better. 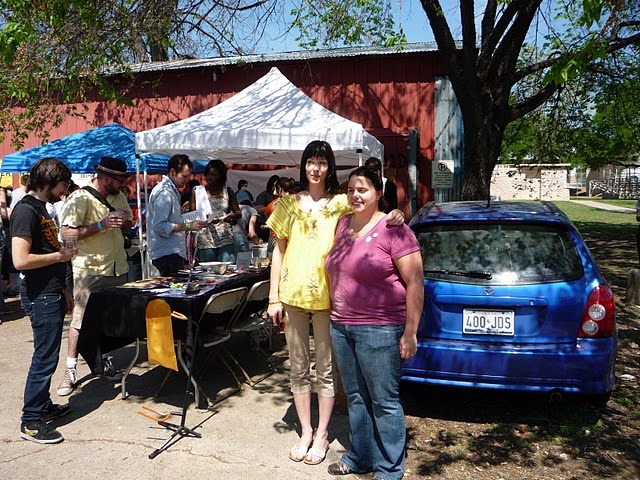 I just found this super cool craft fair in Fort Worth that take place the weekend before we have to be in Austin, so of course my application has been entered for the Funky Finds 2010 Spring Fling! Here’s hoping I get accepted and get to head to Texas just a few days earlier than normal for an awesome craft fair!